Quonset Point Air National Guard Station is located on Quonset State Airport in North Kingstown, Rhode Island, approximately 20 miles south of Providence. The 143rd Airlift Wing of the Rhode Island Air National Guard conducts air logistics support operations from this base. The Quonset Air Museum is located just outside of base and houses a collection of aviation artifacts, aircraft and military vehicles. The city of Kingstown was founded in 1674 and maintains numerous historical sites from the colonial era. 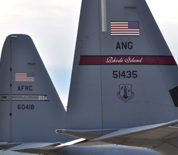 This Quonset Point Air National Guard Station directory features the critical info you’ll need to navigate through the many facilities and recreational opportunities available on base.